Martin Armstrong is once again making waves and becoming a topic of conversation from behind bars. There is much written about his circumstance and his past research. If you are not familiar with his work then it will be worth your time to at least become familiar with his wave theory. 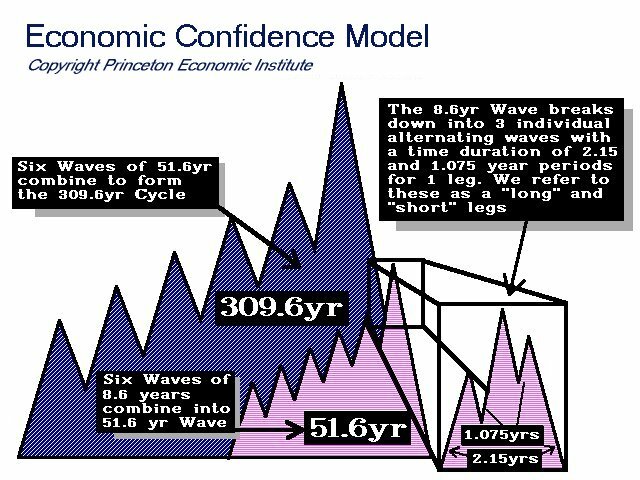 Here is a link to his basic Economic Confidence Model The Business Cycle And the Future . Here’s a link to the article describing why he is in jail for contempt of court: The New York Times, and here’s the article describing his additional 5 year term: The Wall Street Journal. I am NOT defending him, nor do I know or will I speculate on his activities that put him behind bars, I am mearly providing links to the information so that you can decide for yourself. See this http://www.nowandfutures.com/buscycle.htm for his article in .pdf form that he typed while in prison last year. In it he rants and raves a little but he provides some very valuable insights into wave theory, he is way ahead of many others in his understanding, I believe. Is it actionable? Not in the short term, but in the long term I believe his understanding is way better than most. This is a long read, but makes a good skim: It’s Just Time. The article below is a good summary of his pertinent thoughts but does not go very deeply into his wave theory. Most people would consider him to be a little on the “flaky” side. I however do not in any way place him in the “tinfoil” category. He is a creative and outside the box thinker – that does not mean that he is not correct. And, in fact, he has been much more correct than most of the people who ordinary citizens would label “professional.” Now, his timing may not be perfect and he may be a lousy trader and record keeper, but his insights into wave theory should not be ignored. Neither should his insights into the fundamentals of debt or the mechanics of the markets. This is a far better and more accurate article than 95% of the B.S. that comes across my screen. The stock market by no means predicts the economy. A stock market crash does not cause a Depression. The Crash of 1903 was properly titled – “The Rich Man’s Panic.” What has always distinguished a recession from a Depression is the stock market drop may signal a recession, but the collapse in debt signals a Depression. This Depression was set in motion by (1) excessive leverage by the banks once more, but (2) the lifting of usury laws back in 1980 to fight inflation that opened the door to the highest consumer interest rates in thousands of years and shifted spending that created jobs into the banks as interest on things like credit cards. As a percent of GDP, household debt doubled since 1980 making the banks rich and now the clear and present danger to our economic survival. A greater proportion of spending by the consumer that used to go to savings and creating jobs, goes to interest and that has undermined the ability to avoid a major economic melt-down. The crisis in banking has distinguished depression from recession. The very term “Black Friday” comes from the Panic of 1869 when the mob was dragging bankers out of their offices and hanging them in New York. They had to send in troops to stop the riot. A banking collapse destroys the capital formation of a nation and that is what creates the Depression. The stock market is not the problem despite the fact it is visible and measurable and may decline 40%, 60% or even 89% like in 1929-32. But the stock market decline is normally measured in months (30-37) whereas the economic decline is measured in years (23-26). Beware of schizophrenic analysis that is often mutually contradictory or often antagonistic in part or in quality for far too often people think they have to offer a reason for every daily movement. To the left I have provided the Economic Confidence Model for the immediate decline. You will notice I did not call this the “stock market model” nor a model for gold, oil, or commodities. I used the word “economic” with distinct and clear purpose. I have stressed it does not forecast the fate, of a particular market or even a particular economy. It is the global economic cycle some may call even a business cycle. Please note that what does line-up and peaks precisely with this model often even to the specific day that was calculated decades advance is the area of primary focus. Yet the US stock market reached a high precisely with this model and then rallied to a new high price 8.6 months later. In Japan, the NIKKEI 225 peaked precisely on February 26th, 2007. This is not a very good omen. But there was something profound that turned down with the February 27th, 2007 target – the S&P Case-Shiller index of housing prices in 20 cities. February 2007 was the peak for this cycle in the debt markets – not the US stock market. [edit by Nate – this was also the date that New Century Financial, a sub-prime lender, failed. I wrote in my own newsletter on that day that it marked the beginning of the end of the credit bubble]. Keep in mind the stock market bottomed in the mid summer of 1932 when unemployment was not excessive from a historical perspective. The 25% level of unemployment came after the major 1932 stock market low that was followed by both the banking crisis after the election of FDR and before his fateful inauguration. The Banking Crisis came about because of rumors that Roosevelt was going to confiscate gold. Herbert Hoover published his memoirs showing letters written to Roosevelt pleading with him to make a statement that the rumors were false. He did not. There were, once upon a time, usury laws that generally held any interest rate greater than 10% was illegal. The Federal Reserve under Paul Volker believed that interest rates needed to be raised to insane levels to stop the runaway inflation, which was the first stone that hit the water sending the shock waves that we are having to pay for today. Once the usury laws were altered so the Fed could fight inflation, it set in motion the doubling of household debt, not to mention the national debt. At 8%, the principle is doubled through interest in less than 10 years. The national debt exploded from $1 to about $10 trillion in 25 years and household debt has doubled. Some states now consider usury to be 26%. Historically, these are the interest rates paid by the very worst of all debtors – the bankrupts. In fact, in China, the worst creditors historically paid at best 10%. What we have done is the lifting of usury to fight inflation back in 1980, has resulted in usury now being so high, a larger portion of income of the common worker is spent on interest, not buying goods & services that even create jobs. This is one primary reason why jobs have been leaving as well. The consumer needs the lowest possible price and labor wants the highest wages, and to stay competitive, producers leave taking manufacturing jobs as well as service jobs. The extraordinary rise in interest rates that are historical highs since at least pre-Roman times, could not have been possible but for the lifting of usury laws back in 1980 to fight inflation. This amounted to setting a fire to try to stop a brush fire that failed. Consumers pay the highest rates in thousands of years that feed the banks at the expense of economic growth. Even the National Debt rose from $2. 1 to $8.5 trillion between 1 986 and 2006 with $6. 1 trillion being interest. We are funding the nation on a credit card and destroying the economy simultaneously. This has been enhanced by the tremendous leverage and false position that were created in the derivative markets causing the banks to just implode. Indeed, this is the origin of the economic Depression we are facing. The $700 billion bailout might have worked if Paulson did what he said he would – buy the debt and take it out of the banks. Had the debt been segregated into a pool and managed independently by a hedge fund manager not an investment banker, we could have mitigated the problem. But that is now too late. The credit implosion is taking place on a wholesale basis around the world. The more the economy declines in housing prices, the greater the defaults, the greater the foreclosures, and the lower the economy will move. We are now in a downward spiral that cannot be fixed by indirect schemes. As I said, you cannot get your kid’s test scores up by purchasing a mink coat for your wife. Everyone will have their hand out begging for infrastructure money. But the theory of just spending money that will somehow make things better, it is like handing Mexico a trillion dollars and arguing that they will buy US goods that will somehow reverse the economy. The Great Depression is not the perfect model for today. It was a complete capital contraction. The stock market basis the now Dow Jones Industrials fell 89% between September 3rd, 1929 and July 1932. The contraction in debt was quite massive. Then too, the leverage in banks collapsed that reduces the velocity of money and therefore the money supply. The banks were the first real widespread failures with 608 in 1930. Between February and August 1931, the commercial banks began to bleed profusely as bank deposits fell almost $3 billion or about 9% of all deposits. As 1932 began, the number of bank failures reached 1,860. The massive amount of bank failures in the thousands took place with the rumor of Roosevelt’s intention to confiscate gold. Although he denied that was his policy the night of the elections, he remained silent refusing to discuss the issue until he was sworn in. on March 6, 1933 just 2 days after taking office, Roosevelt called a bank “holiday” closing the banks from which at least another 2,500 never reopened. All of these events are contrasted by the collapse in national debts in Europe. Other than Herbert Hoover’s memoirs, I have yet to read any analysis of the Great Depression attribute anything internationally other than the infamous US Smoot-Hawley Act setting in motion the age of protectionism in June 1930. It was the financial war between European nations attacking each other’s bond markets openly shorting them that led to all of Europe defaulting on their debt. Even Britain went into a moratorium suspending debt payments. This is what put the pressure on capital flows sending waves of capital to the United States that to sane degree was kind of like the capital flow to Japan into 1989. This put tremendous pressure upon the dollar driving it to new record highs that were misread by the politicians who did not understand capital flow. They responded with Smoot-Hawley misreading the entire set of facts. (see Greatest Bull Market In History) (Herbert Hoover’s memoirs). Furthermore, we are now in a Floating-Exchange Rate system that has made the global economy far more complex than it was in 1929. We all know that China is one of the biggest holders of US government debt. With the contagion spreading to Russia, South America, and China aside from Europe, we see a steeper decline in the China stock market than we do in the United States because that is where capital had concentrated domestically. If China needs money to stimulate its own economy when exports appear to be collapsing by about 50%, then we can see that the Keynesian model is worthless. If the Fed tries to pump money into the system through buying bonds from the private sector, those bonds may be held by aliens who take the money back to their own economies. The Fed cannot be sure it is even capable of stimulating the purely domestic economy. Lower interest rates to virtually zero like Japan did during the 19905, then if capital finds a better place to invest, it can leave for a higher rate of interest as capital did from Japan to the United states, which is why their domestic economy was never stimulated by the’ lower interest rates. The major support is 3,600 on the now Industrials. During ’09, the support area appears to be 6,600, 5,000, and 4,000-3,600. Clearly, resistance is shaping up at 9,700-9,800. It would take a monthly close back above the 12,400 level to signal new highs are likely. If we saw a complete collapse into a low by April 2009 or June 2009 reaching the 4,000 general area, this would be the major low with most likely a hyper-inflationary spiral developing thereafter. In that case, the now Jones Industrials could be back at even new highs as early as mid 2011 or going into late 2012. There really is nothing left in the tool bag that can help even to mitigate the coming Economic Depression. The unemployment rate at the end of 1930 was only about 8.9% similar to the 1975 recession. Things were very slow back then. Even housing was not moving and people took whatever offers came their way. It was the Dust Bowl that began in 1934 that sent the unemployment rising after the 1932 low in the stock market. About 40% of the work force was agrarian. Hence, Congress could not pass a law to make it rain. The real devastation was that this presented a huge portion of the work force that had to be retrained into skilled labor. It was the Great Depression that finally by force of necessity, created an industrial work force that may have taken another 200 years to unfold by gradual transformation. Unless we attack the debt structure directly, there is no point in counting upon any government to help mitigate the problem and more-likely-than-not, our very future may be recast in so many ways, the level of frustration will rise, and that leads to war because war distracts the people from hanging their own politicians. The oldest trick in the book is to blame the guy next-door down. Unless we are honestly prepared to truly 1) reorganize the structure of government, 2) reorganize the entire debt structure both private and public, 3) regulate leverage, 4) restore usury laws that will free up personal income, and 5) look at just eliminating the federal income tax in combination with 6) establishing a new national heathcare system that will restructure all pension plans public and private, there is not much hope for the future from government. Our definition of money (M1) does not include bonds so we can fool ourselves by issuing $10 trillion in bonds is different than printing the cash. It is still money. Taxes are needed in a gold standard where money cannot be created. Stop competing with the states, control the budget as a percent of GDP, increase the money supply to that degree, and stop the taxing when money is created by leverage and velocity anyway. This will restore jobs and inject huge confidence as in 1964 when the payroll tax was cut permanently. One-offs never work. People save the rebates for a rainy day. We need real honest reform since the states will go broke and seek handouts as well. So, it is time to get real. It is time we restructure the entire system including the banks which always cause the problem. We don’t need excessive regulation of things that did not create the problem when the real culprits always escape.